Otter Co-op operates a modern feed manufacturing facility and manufactures state of the art feed products. 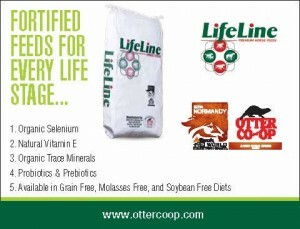 Our alliances with industry experts continues to assist us in developing the LifeLine Premium Horse Feed program. Otter Co-op is a member owned and operated company that has served the residents of British Columbia for over 90 years. This has enabled Otter Co-op to incorporate the latest horse feed & livestock feeds technology and research into products and also provides its customers with unrivaled technical support. C.O.B (corn, oats & barley) with or without added molasses. Just ask our knowledgeable staff any questions you have about equine and livestock grains and feeds-we will be happy to help.